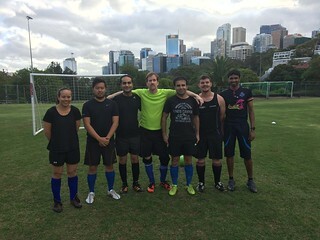 At the North Sydney Evening Mixed Soccer & Touch Comp (Montpelier Rd North Sydney) we play on the bottom fields (Forsyth 2). There is street parking and Toilet & change facilities are available. Wednesday Evening – Mixed Soccer; 6 aside soccer, with max. 4 guys on the field. Wednesday Evening – Mixed Touch; 6 aside touch football, with max. 4 guys on the field. 2. A fully set up field with all the equipment provided. Incl. Drinking Water, Sunscreen, Bibs, Goalie Gloves. 6. All rained out rounds will be replayed if possible. However no guarantees. 7. A Venue Manager with First Aid qualifications, an Soccer referee and Touch Football referee. 8. A Champions trophies for the winners.